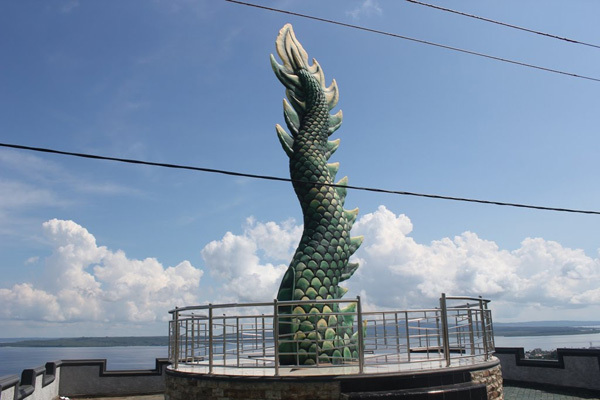 Near to Kamali Beach, you may find the Dragon’s Head Statue. It is definitely stunning and majestic. The thing is you can also find the Dragon’s Tail Statue, which is located near to Bau-Bau Major’s office. That means they are 5 km apart. The name of the tail is Lawero Statue. Tourists often come to the monument either for sightseeing or relaxing. Mostly, they come on the weekend or holidays. Since these monuments are located in the same city, you need to visit them all. The height of Lawero Statue is about 7 meters. It has a green color and the shape is similar to a regular dragon’s tail. That means you may expect many scales on it. The monument is located on a foundation. It is also surrounded by metal fences. The thing is tourists should not touch and come near to the statue. Due to this reason, the best thing to do is to photography. Also, you can relax near to it and talk to other visitors. The statue is located in Palagimata Hill. It is easy to reach as the location is near to Bau-Bau Major’s office. Today, it becomes locals’ favorite tour destination among travelers. Most of the visitors are families. They come to this tourist spot for taking pictures and relaxing. What is the meaning of the figure, actually? Well, it is the part of the dragon head statue near to Kamali Beach. It is an icon of the city. It shows how the dragon dives in the earth and appears in the other location. According to the locals, both the head and the tail represent the origin of Wolio Tribe. It is said that people who live in Muna, Buton, and Kabaena came from China. There is no proof of it, though. You can learn more about the story from the villagers. Each of them even has a different version of it. If you get lucky, you can join a dinner with them. It becomes an opportunity to enjoy local foods like Kabuto, Pokea, Sinonggi, and much more. As for the tips, you need to carry a good camera. It is likely you are going to take pictures in front of the statue. Next, you should bring some money. Several food vendors are waiting for buyers. They sell delicious snacks and foods, so you must try some. Also, make sure to come with either friends or families. It will be a waste if you only come alone. This good spot is suitable for gathering, after all. How can you reach the Dragon’s Tail Statue? It is located in Bau-Bau City. You only need to head to such region. From Kendari, the trip usually takes about 13 hours and the distance is 224 km. When it comes to the route, you need to approach several checkpoints especially Raha City. From Muna Island, you need to take a ferry to Bau-Bau City or Buton Island. That’s all.